Aaaand…. another Retrochallenge! I still try to participate in these whenever I get wind of them, even though I rarely ever finish one. I do it for the fun and camaraderie. For those who have started to put bets on me even starting on one or completing one of these fully, here’s a hint… I WON’T (technically) FINISH THIS ONE! It means that I have a Retrochallenge idea I plan to pursue, but it’ll take a lot longer than one month to actually finish the project I plan to work on during the challenge. Some of you might have known, or have seen, that I had an introductory demonstration of an emulator for a VERY vintage (or ancient) computer called the MOBIDIC… a.k.a. MOBIle DIgital Computer at the Vintage Computer Festival East XIII. 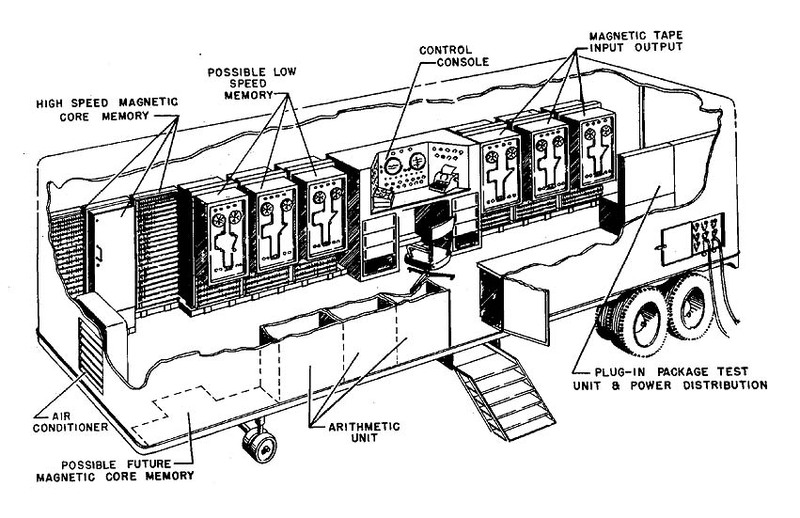 The MOBIDIC was a portable (by 1960’s standards) Von Neumann style computer system designed by Sylvania for the U.S. Army. 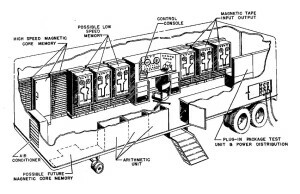 The beast of a machine was all transistorized and mounted in a tractor trailer, ready to be hauled on-site wherever computing and data processing resources were needed. My exhibit demonstrated and introduced the MOBIDIC to the public as a vintage computer worth learning about. An attempt is being made to recreate a full sized MOBIDIC computer using emulation as its core. THAT is my Retrochallenge for this session. I have already emulated an idling CPU for the project before the VCF East demonstration. I have also somewhat created a replica output, which was also displayed at VCF East. The MOBIDIC’s standard output is rows of blinkenlights, but it can also interface with punch or magnetic tape, and teletype output. In the available time allotted for the Retrochallenge, I plan on making the CPU portion do more than idle (running only housekeeping tasks) to a CPU that can interpret the MOBIDIC op-code set and actually process a program. Will this be an easy task or not? I don’t know, nor do I care. I want to do it, and the Retrochallenge is incentive enough to keep me motivated to continue the work I have started earlier this year. I’d wager that the MOBIDIC is the one of the oldest computing platforms ever addressed for any Retrochallenge. It was designed and built between 1959 and 1962. And since it was comprised of so many transistors, it’s more cost effective to emulate one rather than replicate one.